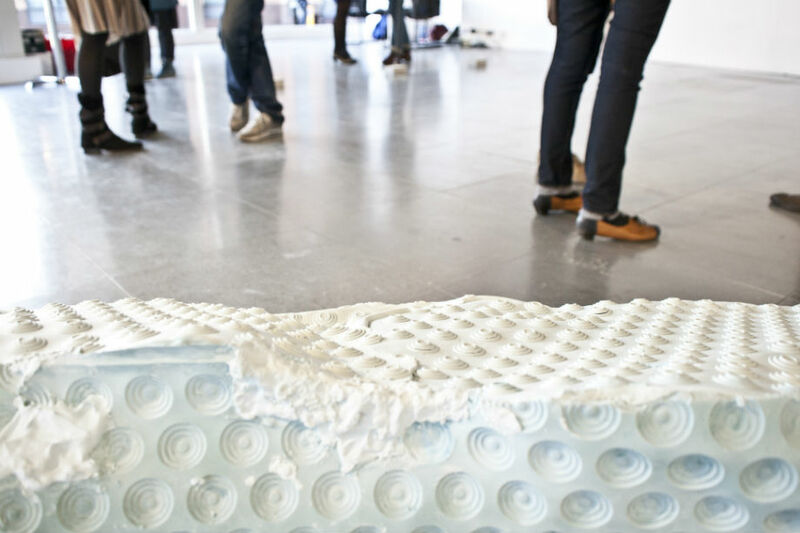 This bench-like sculpture is made with showermats. The candy covered suckers draw the eye and hold the attention, so this work could be the most attractive in its show. But it seems perverse to pick out one artwork from an exhibition which was all about the interplay between pieces by Kox and her friend the artist Rowena Harris. And as you can see from the title, the matted bench was only part II. I could not have told you what was part I. But this is not the kind of show where titles appear to help. A discolouration by what looks like bath salts gives this work of visual art a strong tactile appeal, a perceived fragrance, even an imagined taste. Comparisons with the concoctions of Karla Black are perhaps inevitable, and no bad thing. 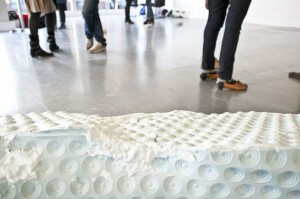 Kox‘s sculpture also risks interference from the over eager viewer. Happily, I managed to resist sitting on If I should loose the reason, can I choose again II. Just as I have resisted the minor spelling correction and adding a question mark. The imperfect title matches the haphazard form and the human scale of the piece. And this was all the sweeter for the more austere pieces nearby. This work can be seen in Punctuating at La Scatola, London, until May 4 2012. See gallery website for more details, and check out this write up in Art Review.